My great-grandfather, Feliks Jaworski, was born in 1872 -1874 in Grzymki. Parents' names (from his marriage record) were Franciszek "Franz" Jaworski and Barbara Lewandowska. I believe Grzymki is part of Romany parish. I did have a member of this forum (thank you, Adam!) check his scans of Romany parish from this period, but he did not find a hit (and there are some gaps). He suggested trying Przytuly as well (near Romany), but I'd definitely need help with this. To my knowledge, Felix was Roman Catholic. My great-grandmother, Wiktorja Kutner, was born December 24, 1880 in Skloty. Parents' names (from her marriage record) were Stanislaw Kutner and Rozalia Sobchinskaya. I believe Skloty is part of Nowe parish. Thus far, I cannot locate any information leading to Wiktorja's birth record. To my knowledge, Wiktorja was Roman Catholic, but I'm starting to wonder if she may have been Jewish faith. Some background information: Feliks was a harness maker who married Wiktorja Kutner in 1901 at NMP church in Lodz, Poland. They had 2 children in Poland: Zofia (born 1902, died 1903) and Helen (born 1904). Emigrated to US in 1904 and 1906 and settled in New York City; had 4 more children. Feliks died in 1932 in NYC; Wiktorja died in 1963 in NYC. Prakseda Jaworski: born circa 1862 in Poland, married Ignatz Lekowski, and emigrated to the United States from Turek, Poland in 1901 with her husband and children; settled and lived in New York City. Prakseda died in 1926 in NYC. Roman Jaworski: born circa 1874 in Poland; made one voyage to the United States in March 1911, and the last address of residence in Poland was with his father, Franz Jaworski, in Lodz, so it would appear that Franz was alive after 1910. In trying to research Felix, Wiktorja, and their parents, I'm hitting huge walls and seeking any family members or any members of the forum who may be able to assist. Please let me know if you can help - I would GREATLY appreciate it. This is extremely important to me, and I thank everyone very much who has tried to help thus far. My great-grandfather, Feliks Jaworski, was born in 1872 -1874 in Grzymki (according to his 1901 marriage record, which is attached); he was Roman Catholic. Via additional research, his parents' names were Franciszek Jaworski (born in Grzegorzew in 1837) and Waleria Barbara Lewandowska (born in Grzegorzew 1841). I believe Grzymki is part of Romany parish. I did have a member of this forum and a professional Polish genealogist check records for Romany parish from this period, and though they were very helpful, they did not find a hit. 1. Is there another parish or town in which the records for Grzymki might be stored? If yes, does anyone have any recommendations on where to look/access to check? 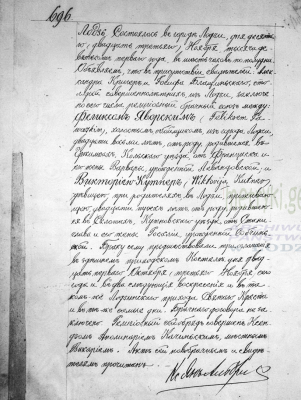 Might the records for Grzymki be held by Russian archives rather than Polish archives? 2. Given the locations of Feliks' siblings' births, is there another Grzymki (or similar city/town) in the proximity of the other towns listed above? My genealogist and I are stumped and can't figure out how/where to check next for this record, so if you are able to provide ANY recommendations on what else we might research, I'm all ears. This is an extremely important record for my family. This mystery has been SOLVED! As it turns out, the marriage record's note of Grzymki as the birth location for my great-grandfather was incorrect (argh). Feliks Jaworski was born on March 15, 1873 in Słomów Kościelny (Psary parish, Turek county, Wielkopolska/Greater Poland voivodeship). As eventually suspected, Grzymki was an extraordinarily distant location compared to where Feliks' siblings were born in the years surrounding his birth. 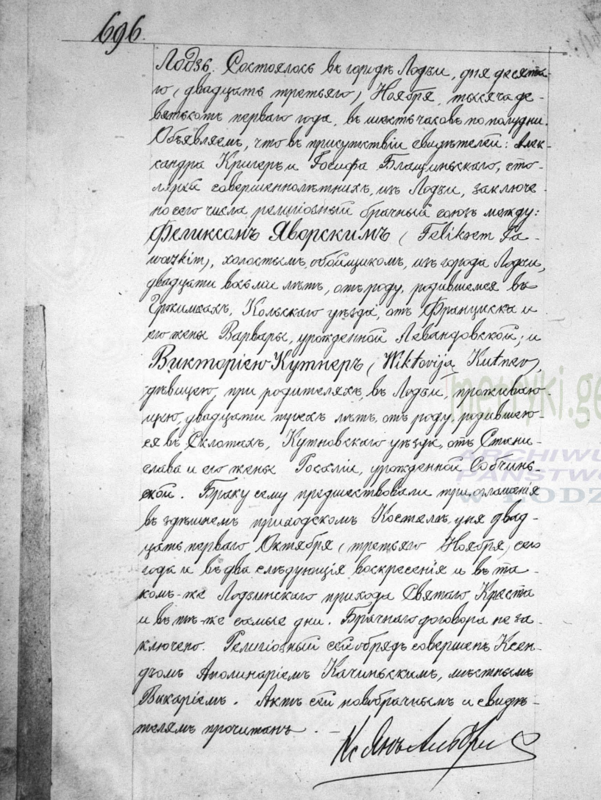 What is also of note is that one of the witnesses in the birth record is noted as living in "Radyczyny" (which could easily have been mistakenly heard as "Grzymki" when verbalized to the priest who created the marriage record), and Radyczyny is only about 4 miles from Słomów Kościelny (incidentally, this was a thought of mine in trying to pinpoint possible birth locations - Radyczyny jumped out at me as sounding similar to Grzymki but being very near the Zimotki and Boleszczyn birth locations of a few siblings). A method that was extremely helpful for me in narrowing my search was creating my own Google Map, populating it with pins for every family event (birth, death, marriage) and then connecting the points with lines to see how the family moved around. In the end, I had the likely birth location narrowed down to an area about 11 miles north/south by 4 miles east/west. In that area, I then looked at town names on the map and looked up their respective Catholic parishes using an online gazetteer, then checked those parishes' records in the 1872-1874 time span - and bam: Psary parish yielded the birth record. After a few years of searching (and learning how to use proper tools/resources to search), success! Thank you to all who aided this effort - persistence and support paid off!